The geese have already started heading south. With the geese showing us that the cold winds are coming sooner rather than later, it means we all must take note. Winter is fast approaching. It is time to squirrel away all our goods from the garden – or local produce if you have not had a chance to grown your own – and prepare for the colder months that are inevitable. This is one of my favorite aspects of homemaking! [Well, I must sound like Dorcas of Larkrise to Candleford when she says “This is my one weakness” – as she says that about nearly everything in the series!] 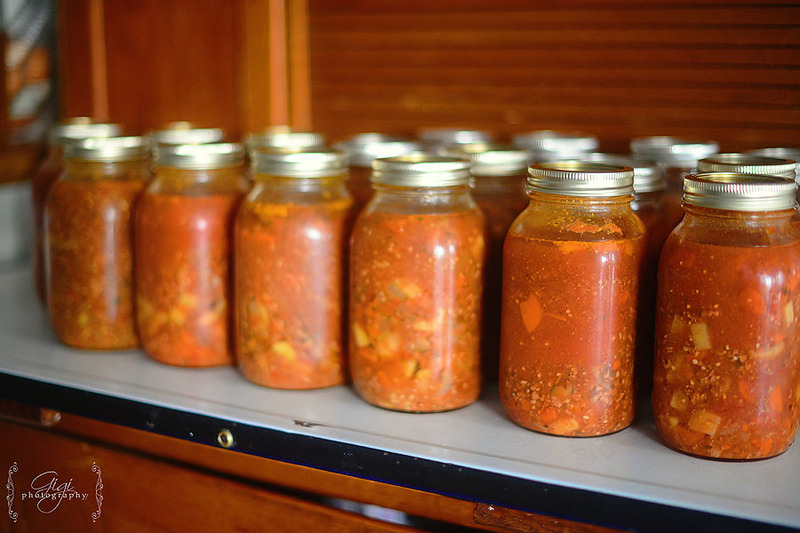 But this truly – canning and putting up food for winter – is one of my favorites of homemaking. It is a beautiful privilege to source out healthy foods, preserve it and provide it for your loved ones during times when nothing is growing locally, when leaving the comforts of your cozy home are daunting knowing the streets and roads are covered with ice and snow. One of my favorite things to can is soup. It is just so incredibly comforting, handy and easy for quick, healthy meals. Soups and stews stretch a long way and can feed many on a little budget. Couple it with a lovely homemade loaf or two of bread and the meal is satisfying. Simmering it all day at the back of my cookstove, letting the delicious smell waft through the home … it is all signs of fall and winter months to come. I am hoping to share a few of my favorite soup recipes with you over the month of September. Do not be fooled into thinking you need a small pot like the one in the photo- that was just for a “few” of the chopped vegetables. I used my big stock pot. The recipe made about 13 litres. When it is time to serve your soup, you may mix up a 1/4 cup or so of flour to about two cups of milk. 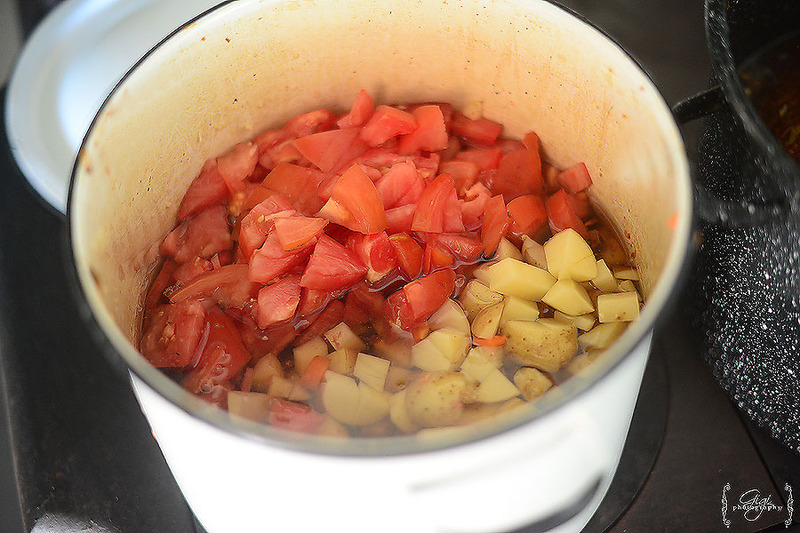 Stir your mixture into your soup as it is heating up (you do not need to boil or cook your soup – just reheat). Feel free to add personal seasonings to your soup as well. In the middle of winter, you will truly enjoy this lovely homemade meal, without stress or fuss. Jennifer A – Pinned! That looks so delicious. (Your photos are fabulous too! )Thanks for sharing on the Homestead Blog Hop! admin – Auntie Kate, we miss you! Yes, they are standing on one stool together. Lovelyn would like you to know she has her first wiggly tooth. She is delighted and wants me to pull it out. I said no! Ugh, blood! admin – Yes, it will cook it. 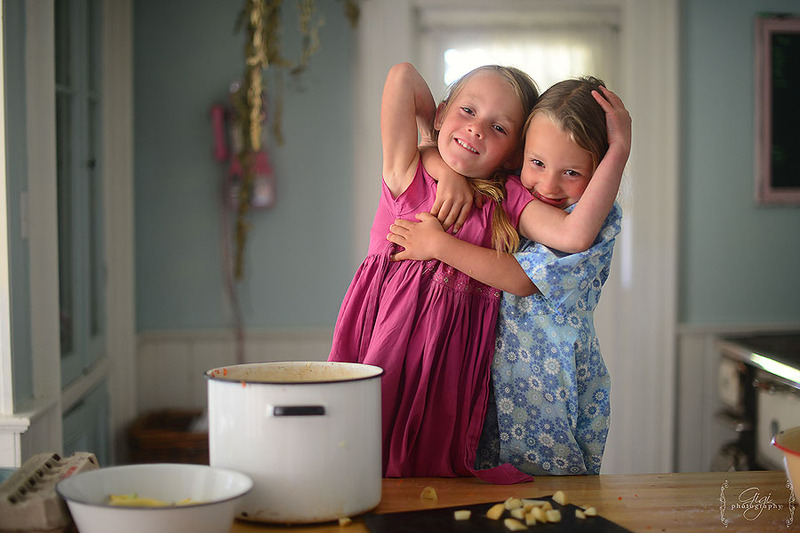 Kyla – where you are only browning the meat, does it get fully cooked when you have it in the pressure canner?